At Icom Australia, we take pride in having a local design team that can create, build and adapt to the Australian requirements and conditions. This means that knowledgeable and friendly staff will be available during the entire process – from initial assessment and planning, to deployment, and most importantly, to offer ongoing assistance to ensure your system continues to offer the outstanding performance you demand. Communications systems will also be developed with growth in mind: so should your organisation experience sudden or gradual growth, an Icom solution will accommodate this with minimal interruption. With offices worldwide, and headquarters located in Japan, Icom Australia can draw on a range of resources to find the perfect solution. Icom Australia has factory-trained staff in-house and has frequent communication with engineering personnel in regard to technical enquiries. This ensures that queries can be attended to in a timely manner. As a truly global organisation, Icom Australia has contact with other Icom offices worldwide, allowing information sharing among technical staff. This has allowed the company to create a global knowledge base, meaning any questions you might have about Icom solutions have already been investigated and answered. This helps to streamline the systems design and implementation process at Icom. Customer requirements, what does the customer want to achieve? Scope - What is the current size of the organisation (staff, geographical area etc.)? Will the business be affected by expansion in the foreseeable future? Problem Identification - Are there any black spots within the current communications? Is there a security issue? Are there separate sites that need to communicate with each other? Is this replacing an existing system? Applications and custom features - Does the customer require communications to be integrated into other systems? To provide further reassurance, the entire process will be documented, ensuring that everything is transparent and signed off before work commences. With no hidden surprises, you can rest assured that everything will be implemented on time, and most importantly, on budget. Icom firmly believes in a highly consultative process, and can tailor the system upgrade management process to the needs of the customer. Anything from full-scale management of the project to something more hands-off is available (i.e. for a large company that has a communications/IT department), and totally at the discretion of the customer. When the system is ready to use, devices can then be deployed to the field. This will first involve programming radios with the correct channel information, ID numbers and any other settings that may be required. Once programmed to specification, Icom staff will be heavily involved with training to individual users, ensuring that your staff are confident in using the new system. With communications vital to safety and productivity, it is important that this is conducted professionally. After the planning and design is complete, the system is now ready to be built and tested. This is all done in-house before delivery, to ensure a working system is delivered with minimal configuration required. This helps to achieve a seamless changeover, meaning that normal business processes have minimal interruption. Once the system is ready for delivery, our expert team will be on-site to integrate it into the organisation. 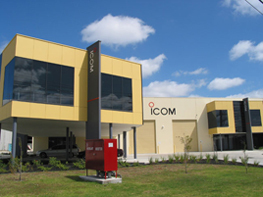 With over 30 years’ experience supplying communications equipment in the Australia/Pacific region, Icom Australia is fully capable in delivering turnkey solutions that offer an easy migration path, and above all, are designed with flexibility in mind; so that no matter the requirement, Icom will have the perfect solution for your needs. Icom products are favoured by many 3rd Party Suppliers, in that they are extremely easy to integrate with other products. This is why Icom has strategic alliances with many communication solutions companies, making integration with AVL software, dispatch consoles and many other applications very simple and user-friendly. So no matter your application, Icom Systems will have a proven solution for you to enhance communications, and above all else, safety and productivity in your organisation. We can provide on-site installation, testing and optimisation when required. We will provide accurate and up to date system documentation with all systems and turnkey solutions offered by Icom Australia. Delivering products is not enough. Icom prides itself on supporting customers long after the system has been installed. By offering warranties, scheduled maintenance and many other services, you can be sure that your system will stay in optimum condition, to be ready for any challenge your organisation may throw at it. Icom Australia’s systems department will also provide full technical training to our clients when and where it is required, this will ensure that the system can be operated successfully and maintained by the people who are using it. While analogue communications have served businesses well in the past, digital systems have now become the preferred option for many organisations, as they offer greater functionality and performance. However there is still a very strong uptake of analogue radio systems and Icom Australia’s system team can design and implement any analogue system requirements you may have. • Greater transmission range - although the signal will travel the same distance whether analogue or digital, a digital signal will be able to be understood right up to the edge of the transmission range. • Security - digital modulation/demodulation is extremely difficult to decode through scanners/receivers at this time. IDAS, which stands for “Icom Digital Advanced System”, is a digital radio technology which uses the Frequency Division Multiple Access (FDMA) protocol. This makes it very efficient when using radio spectrum. Both NXDN and dPMR operate under the IDAS specifications. IDAS NXDN is a digital protocol that focuses on small to medium sized users. It operates on both conventional and trunked mode, and is capable of mixed-mode operation, making it a versatile solution for those who want to migrate from analogue to digital at their own pace. This makes it cost-effective for those who may not want to replace an entire workforce of communications equipment all at once. An IDAS multi-site trunking system is capable of interconnecting up to 48 sites and can administer up to 60,000 IDs (terminals). IDAS dPMR has been designed as an upgrade to existing MPT1327 analogue trunking systems. Like NXDN, it is capable of mixed-mode operation, but has a larger capacity system size (Maximum 1024 sites and 500,000 IDs). This makes it a versatile solution for established large businesses, or those wanting to expand operations over time. IP linking or Radio over IP (RoIP) allows communication sites in vastly different locations to be linked over an internet connection. This allows large organisations with many country-wide or even worldwide offices/plants etc. to stay in touch over radio, ensuring business processes are efficient, helping organisation-wide productivity. As reliable and efficient as traditional radio is there are some situations that require an alternative technology. Our revolutionary I.P radio system has been designed to provide an excellent solution to situations where traditional radio struggles or is too expensive to deploy. The I.P capability of this radio system makes it possible to easily link sites via I.P nationwide or worldwide. 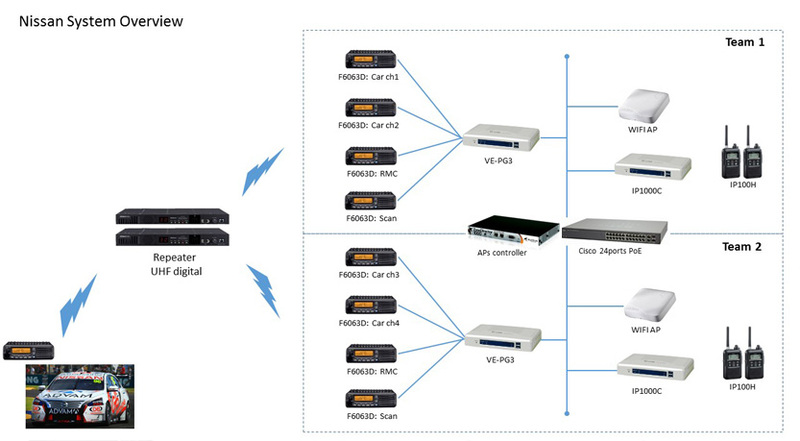 With the addition of our VE-PG3 (Voice over I.P/ audio bridge) unit, this allows us to interface traditional radio back into the I.P 100 radio network and vice versa, we can also incorporate PSTN and SIP connections into the network making this an extremely powerful radio network. An example of an I.P solution can be seen here with our case study for Nissan Motorsport. Icom Australia’s system department has the expertise and knowledge to design and implement an I.P solution. Please refer to our I.P100 web page for the benefits of using an I.P radio System. With an ever-growing list of 3rd party applications compatible with Icom equipment, systems can be tailored to the requirements of the user through these applications. While installation will be conducted by Icom’s trained professionals, 3rd party support will be available from the application experts, meaning any issues can be addressed correctly and efficiently. By integrating task-specific applications into communications, organisations can keep track of many critical functions. Dispatch software allows jobs to be sent over radio, Automatic Vehicle Location (AVL) keeps track of vehicles while on the-job and system management software keeps communications running smoothly. Man down and lone worker applications are available as well as remote site monitoring capabilities. Delivering products is not enough. Icom prides itself on supporting customers long after the system has been installed. By offering warranties, scheduled maintenance and many other services, you can be sure that your system will stay in optimum condition, to be ready for any challenge your organisation may throw at it. Has your business recently expanded? Do you require re-programming? Icom’s trained professionals are available to assist with any requests you may have.